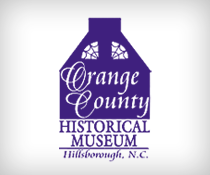 In May 2007, the Orange County Historical Museum merged with the Hillsborough Historical Society to form the Historical Foundation of Hillsborough and Orange County (hereafter Foundation). The offices and collections of the Foundation are located at the Orange County Historical Museum. The Foundation was incorporated in 2007 under the Museum’s Tax Identification Number and was granted the same 501(c)(3) status. The Foundation operates the Museum. The mission of the Historical Foundation of Hillsborough and Orange County is to enlighten and engage our community and visitors from around the world by preserving and interpreting the history of Hillsborough and Orange County. Our goals include: operate the Orange County Historical Museum; collect, preserve, catalog, and house historic artifacts and documents relevant to Hillsborough and Orange County history; use the Museum’s collections as a tool for educating the public about our history through exhibits, in-house and outreach programs, public lectures, publications, and special events; make historic documents, artifacts, photographs, and other records available to those researching Hillsborough and Orange County history; provide support and assistance for historic preservation efforts in Hillsborough and Orange County. The Museum is open to the public, free of charge, 6 days a week, 52 weeks a year. Our normal operating hours are Tuesday-Saturday 11-4pm, and Sunday 1-4pm. In January, we reduce our hours of operation to Tuesday-Sunday 1-4pm.